The 1980’s was certainly a bumper time for the introduction of new slang words into the English language. Â Of course every decade before and since has added its own new words, but having grown up in the eighties hearing some of these terms uttered today takes me back to my childhood, but also makes me realise how ridiculous we must have all sounded at the time! Â Here is a list of some of my favourite terms. Bad – Meaning Good or Great, as popularised by Michael Jackson. Â Nice one for confusing your parents. Â I suspect this is where the more modern term Wicked originated from. Brill – Short for brilliant (fairly obviously). Â Seems terribly dated now. Â Try saying it in conversation and you’ll immediately feel silly! Chinny Reckon – Also Jimmy Hill, Itch My Chin and many more variants. Â Such a great insult phrase I devoted an entire post to it. Cool – Dating back to the 1950’s at least, Cool enjoyed a bit of a resurgence in the 1980’s and hasn’t really gone away since. 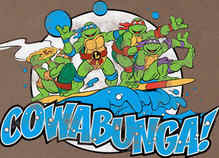 Cowabunga – Like a lot of eighties slang, this term originated from those cool California Surfing types, but for me it will always be a phrase associated with the Teenage Mutant Ninja Turtles (or Hero turtles if you were from the UK!). Â Basically it means something along the lines of “look out, here we come!”. Dag – Not one we used much in the UK, but was extremely popular on Australian soaps such as Neighbours. Dude – A cool male. Dudette – A cool female. Lame – The very opposite of cool. Lamer – A term made popular on computers such as the Commodore Amiga by the demo writing hacker groups. Â A derogatory term applied to anyone who wasn’t part of your team, or to imply that you were more skillful than they were. Ponce – Another great insult term. Â If somebody did something stupid, for example scored an own goal playing football then a cry of “you ponce” would be a suitable put down. Â Could also be turned into “poncey” to describe something that was overly fancy or considered girly by the boys. This entry is filed under Miscellaneous	and was posted on April 14th, 2009. You can follow any responses to this entry through the RSS 2.0 feed. You can leave a response, or trackback from your own site. Yeah, I have used all of these at one point or another! I still regularly use ‘ponce’. Yes, “ace” was a good one at the time. Funny, it feels really dated to me now though. If I were to go around saying things were “ace” I think I’d feel a bit stupid. Er, sure, if you like. Have to admit I had to look that one up, it was never used round our way. We tended to go with one of the variations on spaz. e.g. spazza, spazmo or the ultimate spazmo-deacon. Ha! As one who comes from Australia himself, I certainly remember “dag” (which in addition to cropping up regularly in soap operas and regular schoolyard conversation, also appeared in an anti-smoking ad on TV with the oh-so-catchy tagline of “Only dags need fags!” (or something equally vomit-worthy)). 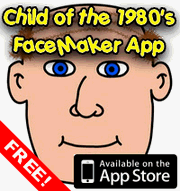 I’m not sure it went away when the ’80s did either. Towards the end of the following decade, for example, there was an independent movie that came out here called “Dags”, whose cast seemed to consist entirely of various kinds of social misfit (perhaps because he saw something of himself in it, a prominent nerdy media personality here was so impressed with it he gave it a rating of (n+1) out of n stars! How daggy is that?!). Other ’80s slang terms I remember from my own part of the world were “dero” (short for derelict? ), which seemed to have roughly the same meaning as “dag” (certainly it was used to indicate one’s disapproval of something or somebody), and “ex”, which was a lazy way of saying “excellent”. There were a whole bunch of other slang terms that became popular towards the end of the decade thanks to a TV character called Kylie Mole, but unfortunately I can’t remember off the top of my head what any of them were. how about cool beans ?